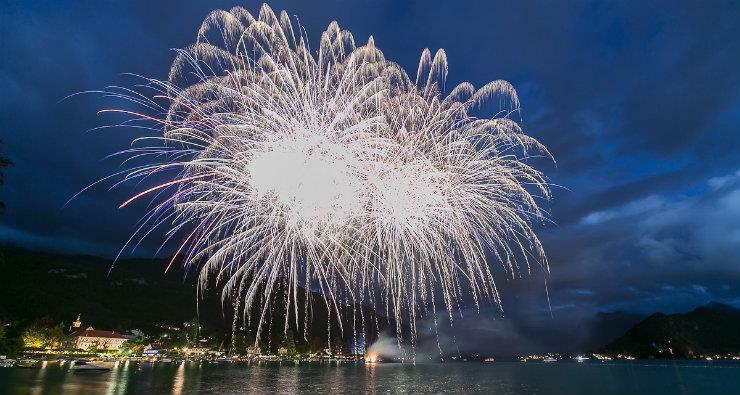 This year the Abbey of Talloires celebrates its millennium, it is thus normal that Pyroconcerts celebrates in their own way this exceptional anniversary. Specially come from Great Britain, the vocal group APOLLO 5 will not blow fires and thousand candles which, for the time of an evening will illuminate all the abbey and its environment. On the other hand the 5 singers, applauded and recognized in all big European festivals, will come to propose a musical journey covering thousand years that separate us from the creation of the abbey. Their repertoire voluntarily highly varied and interpreted in the classic way and with the "so British" charm which characterizes them, allows everybody to find pleasure and emotion. The secrets of this pyroconcert? .. magnificent voices and notes of classic, pop, soul and jazz which agree at best with the charm of gardens and old stones of the abbey under the lights of one thousand candles and fireworks always so enchanting with a huge final fired from the lake. A really charming and magic entertainment for all the family!